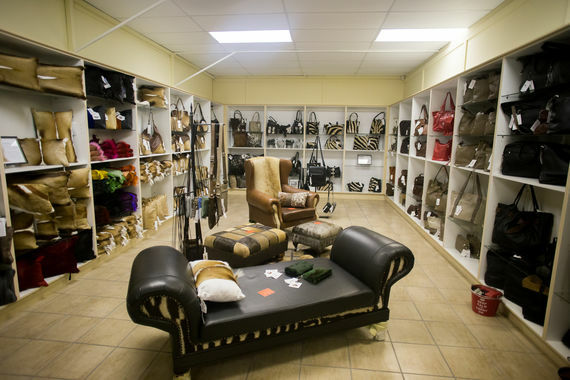 An investment in machinery to process crocodile hides into sought-after leather used in fashion accessories has given a new lease of life to Klein Karoo International Leather. “Our facilities have suffered a lot over the years due to lack of investment. So, infrastructure was not in a good condition but the Productivity Improvement Programme (PIP) has put our infrastructure in a state where we can again compete internationally,” says company MD, Charl du Plessis. The business is a subsidiary of Klein Karoo International, a co-operative owned by farmers from the region who specialise mainly in produce from ostriches – including leather and meat – as well as other agricultural products. Du Plessis says the diversification into tanning crocodile hide was a natural extension from its ostrich leather heritage given the similarity in markets as a raw material for luxury leather goods. The new machinery can also be used for processing of ostrich hides. This emphasises the significance of the support that has been extended to the textiles industry through CTCP since it was introduced in 2010. An important outcome from the support that Klein Karoo International received is its new-found ability to add value through local beneficiation. Du Plessis says that the value of the raw hide practically doubles once it has been tanned and finished. One of the reasons that the company places such a high priority on employment is that jobs are scarce in its rural environment. The nearly 220 staff therefore support up to about 12 people each, with up to 30 new jobs having been created from the expansion into crocodile hide processing. Interestingly, the challenge for Klein Karoo International has been less about needing to overcome competition of cheap imports from China than it has been about entering established, highly competitive export markets. Its main competition is in Italy, which has well-established exotic leather processors numbering up to about 250 tanneries. Klein Karoo, however, has been able to successfully identify a market in Japan and to supply high-end brands like Luis Vuitton and Hermes. Du Plessis says that one of its major advantages is that the processing of exotic leather requires a high level of skill. For this reason, the company has prioritised training of staff and incentive schemes that reward them for developing new ideas that could appeal to global fashion tastes.